My appreciation to Andrew Salmon for this copy of his work. As stated in the foreword, the Fight Card series was inspired by pulp tales such as the Sailor Steve Costigan tales from the pen of prolific pulp master Robert E Howard. The idea was to write pulp fiction novelettes with a boxing theme central to the plot. This was later revised to include various other forms of unarmed combat. Sherlock Holmes fans may remember that Holmes was proficient in boxing, single-stick fighting, and baritsu. Watson records Holmes’ amateur match with a professional bare-knuckle boxer; and his “straight left against a slogging ruffian” which sent Mr. Woodley home in a cart. 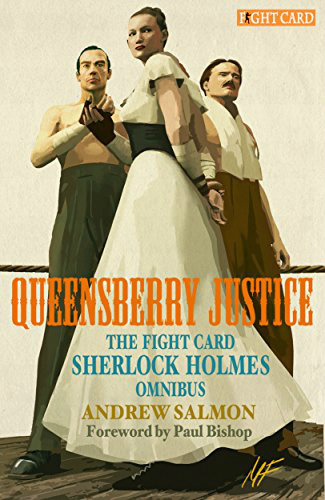 Andrew Salmon has used these references to good use in writing the three Fight Card: Sherlock Holmes adventures that make up this omnibus. Each adventure is a genuine Sherlock Holmes tale of logic and deduction but part of the story finds Holmes in the world of underground bare-knuckle fighting. In the case of these stories the fighting and the mystery are so well paired that one could not exist without the other. Holmes may be going primal in the ring but the cold logic of his thinking makes him all the more deadly. I like the nod to Holmes’ step by step thinking displayed in the Robert Downey Holmes movie. The stories are spiced further with Victorian slang and expressions which are all referenced in the glossary at the end. The second tale is named “Blood to the Bone.” Holmes is not alone in his fights in the ring; a lady boxer named Eby Stokes is also fighting for the cause. This is a case of the Irish Uprising. Mycroft is involved, as the mystery involves National Security. The Boxing Ring, a circus, and a train add to the mystery! The third tale is called “Taking Ground.” A returning foe with a vengeful spirit wants Holmes dead. Watson is also marked for death. Holmes is older now, but he must venture into the ring one final time before the case can rest. It is a battle Holmes will never forget. Andrew, you have done one incredibly awesome job in this work! I gladly give this collection five stars plus!